Our expert abseil painting team has now completed 50% of the painting works at 81 Point St in Pyrmont, where our team has been engaged to carry out remedial repairs to the external facade and paint the whole building working with a colour consultant and strata. To date we have completed in full 50% of the project and is expected to be completed within the next 2 weeks…we will keep you posted on our progress and if you wish to see out team or quality of work please dont hesitate to come down to the buildings and meet our team…. Abseiling painting is the most cost effective form of access and carrying out building maintenance. Quaypoint has taken advantage of our services and saved themselves over $100,000 in scaffold costs…. 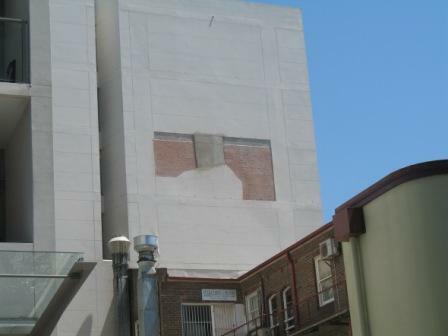 Remedial Render Repair Works are currently being carried out by Advanced Solutions Group on a major residential building in the Eastern Suburbs of Sydney. Our skilled and professional abseilers are midway through repairing large areas of cracking and degraded render, which has been falling from the structure due to incorrect installation upon construction and insufficient expansion allowances. We are pleased to be able to provide an answer to building management for what is clearly an area of major concern. One of the many pieces of original render which was partially missing at the time we carried out our initial survey was over 6 metres long and 3 metres high. This very large piece of render had fallen to the roof of the building below and presented a very big task in removing the remaining pieces of bulging render without allowing large pieces to continue to fall to the area below. See picture below. There were around 20 other areas on the structure with cracked, bulging and loose render, where our team have carried out render removal, grinding & cutting, preparation of the surface, re-rendering, waterproofing and painting in order to begin to restore the facade of the structure to how it looked when it was first constructed and to eliminate the possibility of these areas we have worked on from falling again. Do you have a similar project that we can assist with? We have a very competitive pricing structure within our own industry, and in comparison to other remedial building services which utilise lifting equipment, scaffolding, or building maintenance units, we cannot be beaten on price. We are able to provide the highest standard of workmanship for less cost to you, the customer. Please call our customer service team on 1300 789 474 to find out how Advanced Solutions Group can assist with all your building maintenance needs. Please visit our website to view the vast array of services and solutions we provide. Industrial Rope Access Concrete Repair and Rendering enables spalling repair and other degraded concrete and render repair to be carried out without costly BMU equipment or scaffolding. Advanced Solutions Group provide expertise in the area of concrete repair services via abseil technique to the building management and maintenance industry throughout Australia. We have a highly trained and professional team who possess a wealth of experience in the remedial building works sector. With specialists in many areas including concrete repair and rendering, we are able to reduce the cost to our customers in maintaining and repairing degraded concrete elements of any structure. If you have previously been contracting remedial works builders who work with scaffolding and lift equipment, no doubt you have discovered how expensive these methods of access can be. Why not find out how Industrial Rope Access personnel can provide you with the same services and expertise for less money and time. Advanced Solutions Group successfully carried out a major difficult access artwork removal project recently, engaged by a prominent Australian Financial Group. Our expert team of Abseilers and Riggers were able to successfully provide difficult access services to lower two very large Australian paintings down 23 floors via the lift shaft of one of Sydney CBD’s tallest buildings. With experience in rope access rigging of all sorts, Advanced Solutions Group are able to provide you with services where you require large or small, fragile or valuable items to be relocated where other methods of removal and relocation are impossible. Our client was unable to find any other company to carry out these works and we are proud to have provided them with our expert knowledge of abseiling and rope rigging to facilitate the relocation of very valuable artwork from their extensive collection. We will be posting photos of this epic relocation process shortly….. stay tuned. We are extremely proud of our expert abseiling and rigging team and would love to assist you with any difficult access item relocation needs you may have. Please contact our Project Manager on 0414 59 49 65 to find out how we can assist you! 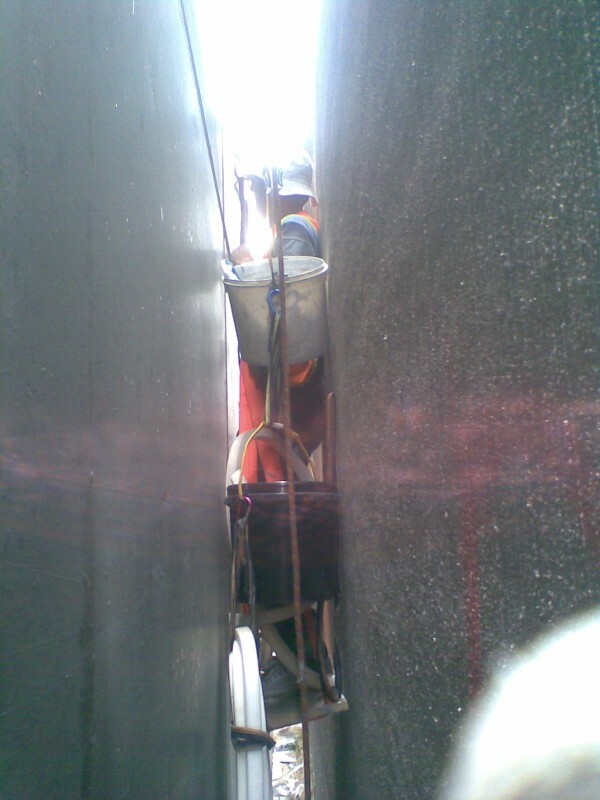 Our expert personnel are always impressing us with their commitment and skill with regard to how they conduct difficult access and confined space access works. See below for just one visual example of our abseiling team accessing a 350mm gap between two buildings via Industrial Rope Access technique, in order to carry out expansion joint sealing works. Building maintenance costs can be reduced effectively by employing abseilers or industrial rope access technicians to carry out works that would otherwise be carried out via expensive scaffolding or mechanical lifting equipment. Advanced Solutions Group provide a wide array of services in the building maintenance and remedial building works sector, specialising in those difficult access and confined space works, so often put into the ‘too hard basket’. Whether it’s concrete repair, high pressure or soft wash, painting, or any other remedial works or maintenance works that you require, Advanced Solutions Group are looking forward to opportunities to provide you with building maintenance services via industrial rope access. Our expert abseilers are ready to carry out difficult access works for you. Challenge us……We look forward to it! Our team has now completed over 25% of the painting project at 81 Point St Pyrmont (come by and see us) where we have been engaged to carry out external facade abseil painting using our industrial rope access method to access all areas of the building, and this technique allow us to provide our client with a cost effective solutions to paint the building and carry out remedial concrete repairs. Rope Access Painting has provided this residential complex with a cost effective means of rejuvinating the exterior of the two six storey buildings. This complex is a main feature of pyrmont point and Advanced Solutions Group are proud to have been engaged to carry out these works. To see how Advanced Solutions Group can assist you via Industrial Rope Access to carry out difficult access painting or other works, please contact us at any time on 1300 789 474. Our expert abseiling access concrete repairs team has started works at Maroubra Central Apartments, requring remedial works to the external facade, and our abseil access techniques to do these types of repairs has provided our client with a trusted cost effective solution. We will be on this project for the next 4week so we will keep you posted on our progress.. you will also be able to see our abseil access team in our photo galler on our main web site…. if you have abseiling access concrete repairs please go to our web site or call us … you can see the main web link in the yellow box up the top of this page. Does your building have external windows that need periodic cleaning, or other maintenance needs that can’t be easily accessed? Are you paying expensive BMU costs, Access Lift Equipment costs and other access costs? Why not consider installation of Fall Arrest and Abseil Window Cleaning Anchorpoints! Anchorpoint Installation is a relatively cost effective method of establishing a Workcover, OH&S and Australian Standards compliant system of access to the exterior facade of any building to facilitate rope access facade maintenance, window cleaning, or any other form of remedial works required to maintain structures effectively. Advanced Solutions Group are able to provide cost effective access methods where industrial rope access is required. This is achieved by design, installation, testing, tagging and certification of anchor point fall arrest systems, as well as other height safety solutions. Whether you have a concrete substrate roof slab, colourbond roof sheeting, kliplok (clip lock) roof sheeting, or any other form of roofing or structure feature that requires anchor point installation to facilitate rope access maintenance, Advanced Solutions Group can provide expert installation of anchor points and other fall arrest systems to assist you in reducing your maintenance overheads and maintaining a safe, compliant approach to building maintenance. If you would like to find out how Advanced Solutions Group can provide you with a height safety system to suit your needs, please contact our Project Manager on 0414 59 49 65 or phone our customer service team on 1300 789 474. To see what kind of other services Advanced Solutions Group are able to offer you, please also visit our website. Our team have now successfully now completed the second stairpod, that required expansion joint replacement s and complete covering using Emer-clad waterproofing membrane.